Mass brand River Island has created a Fall/Winter 2012 lookbook of outfits designed according with the season’s fashion trends like Baroque and leather. The lookbook is heavily influensed by the Baroque style in particular featuring embellished jackets, jacquard patterns, and floral prints. There are also oversize items and fur pieces in the collection. As usual the collection is very close to the designer creations. One of the looks with the red chemise dress decorated with black lace and beads instantly makes me think about Givenchy Fall 2012 RTW collection. The leather gloves reinforce the resemblance and add a gothic touch to the collection. 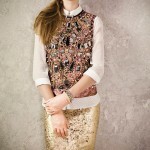 There are also Baroque-style tea dresses that will help fashionistas rock this trend. The black gold pieces look as if they were inspired by the Fall 2012 RTW collection by Dolce & Gabbana featuring embellished head gear, belts, clutches, and other accessories. The footwear in the lookbook includes the sandals, ankle booties, and platform flats. There are also some casual pieces like jeans, sweaters, and various tops for mix and match game. The wine-colored leather dress above is my favorite and it looks in combination with that fur vest and black ankle boots.